The National Institutes of Health will fund six projects to identify biological factors that affect neural regeneration in the retina. The projects are part of the National Eye Institute (NEI) Audacious Goals Initiative (AGI), a targeted effort to restore vision by regenerating neurons and their connections in the eye and visual system. These projects will receive a total of $12.4 million over three years, pending availability of funds. “Understanding factors that mediate the regeneration of neurons and the growth of axons is crucial for the development of breakthrough therapies for blinding diseases. What we learn through these projects will have a health impact beyond vision,” said Paul A. Sieving, M.D., Ph.D., director of NEI, part of NIH. Most irreversible blindness results from the loss of neurons in the retina, which is the light-sensitive tissue in the back of the eye. Many common eye diseases, including age-related macular degeneration, glaucoma and diabetic retinopathy, put these cells at risk. Once these neurons are gone, humans have little if any capacity to replace them. One of the six teams is of Dr. Levine at Vanderbilt Vision Research Center. Levine and his colleagues are investigating exogenous and endogenous factors — that is, factors with an external or internal origin — that contribute to the successful reprogramming of supportive cells in the retina called Muller glia. In zebrafish, Muller glia can give rise to photoreceptor cells after injury to the retina. 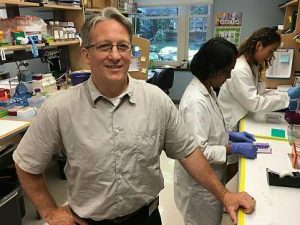 First, the investigators plan to test a novel combination of pharmacological agents and genetic manipulation for the ability to reprogram Muller glia in mice. If the therapy is successful, they will then study the conditions that support regeneration by determining which genes are turned on or off in regenerating zebrafish and mouse Muller glia. A second component of their project will look at the role of exosomes, tiny cell-secreted vesicles commonly found in blood and other bodily fluids, in promoting regeneration.